By incorporating on-chip multiplication gain, the electron multiplying CCD achieves, in an all solid-state sensor, the single-photon detection sensitivity typical of intensified or electron-bombarded CCDs at much lower cost and without compromising the quantum efficiency and resolution characteristics of the conventional CCD structure. Welcome to the Hamamatsu educational website featuring a wide variety of review articles, interactive tutorials, image galleries, and product descriptions designed to assist our visitors in exploring the fascinating world of digital imaging. Hamamatsu introduces the new ORCA-Flash2.8, our first high-sensitivity digital camera based on a next-generation scientific CMOS image sensor. Designed for low-light imaging at high frame rates, this new camera combines high resolution, high sensitivity, high speed, and low noise at an affordable price. At the camera's core is a new scientific CMOS image sensor, the FL-280, which features 2.8 megapixels and a pixel size of 3.63 × 3.63 µm, ensuring high resolution. The sensor's wavelength sensitivity ranges from UV to visible, with peak sensitivity (over 60% QE) at about 450-500 nm. In addition to high sensitivity, the sensor features low readout noise, typically 3 electrons r.m.s. The sensor's design keeps the readout noise minimal even at very fast readout speeds, unlike traditional image sensors. The FL-280 sensor also has low dark current. Because of its intrinsically low dark current, the sensor requires cooling to +5°C only. Built for high-speed imaging, the ORCA-Flash2.8's readout speed ranges from 45 frames/second at full resolution up to 1273 frames/second with sub-array readout. Other features of the camera include external trigger functions, real-time corrections, and analog gain. The camera is designed for quantitative measurements with 12-bit output, and it interfaces with a PC using a CameraLink frame grabber board (included with the camera). The ORCA-Flash2.8 is suitable for a wide variety of applications. 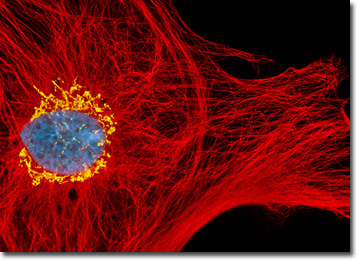 These include life science imaging such as ratio imaging, FRET, FISH, TIRF microscopy, and real-time confocal microscopy. Other applications include semiconductor inspection and industrial imaging. The expansive cellular microtubule network present in a culture of Indian Muntjac fibroblasts (illustrated above) was immunofluorescently labeled with primary anti-tubulin mouse monoclonal antibodies and rabbit anti-giantin polyclonial antibodies followed by goat anti-mouse Fab fragments conjugated to Rhodamine Red-X and Alexa Fluor 647, respectively. The culture was also counterstained for DNA in the cell nucleus with Hoechst 33342. Images were recorded in grayscale with a Hamamatsu Orca-AG camera system coupled to an Olympus BX-51 microscope equipped with bandpass emission fluorescence filter optical blocks provided by Semrock. During the processing stage, individual image channels were pseudocolored with RGB values corresponding to each of the fluorophore emission spectral profiles.